Ok, so you are the few that actually have life. Let’s get into it. MySQL Cluster Manager is an application that does one thing and one thing only: it installs and manages the proper configurations of cluster(s). That said, it’s not replacing by any form of shape the Cluster Management node which responsible for the correct operations of the nodes. Actually, MCM will setup those nodes as well, as you’ll see soon. This post assume you have 4 machines, quite possibly virtual, with Linux installed (mine are Oracle Linux 5.5 x86) and network connection between them. As you can see from the picture, the agent has to run on all the servers (nodes). Actually, that’s the only time you’ll have to do something on all the node manually. From here on, the agent will take care of things for you. Not only that, the agents are synchronising between themselves, so you can connect to any of the nodes with the manager and control the whole cluster(s). Edit: from version 1.1.1(GA) there’s no need to edit the mcmd.ini file. You can if you want, based on the man page. Now do the same for each of the hosts (from the /etc/hosts part, just below the picture). 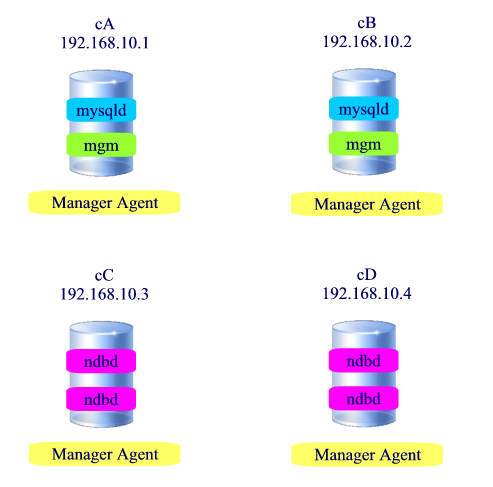 Connecting to the manager is achieved by using a regular MySQL console application directed to the Manager port that we set before (default 1862). You can install MySQL client or just use the console we extracted with the cluster package. That will show you the list of commands (duh…) that the Manager accept. It worth mentioning that using command –help will provide you with full details of the command. Site holds clusters. You can have multi-sites. Packages are used to maintain and upgrade clusters with one command. You have to have at least one cluster package to create a new cluster. Before we start the cluster, we should set the parameters that applies to it. Some cannot be changed after the first start, such as NoOfReplicas. Most will only required restart of the cluster. Setting values, other than the defaults (which is highly recommended for production clusters! ), is set the same way as get, but with set command. Ok, it’s time to start the cluster… Note the use of the flag -B to start the cluster in background. If you don’t use it – the prompt will be waiting for the cluster to start (or fail) without an option to see what’s going on (unless you connect with another console). Our cluster is up and running! Ok, we did all that for…. what? Haa, yes…. To have a fully redundant, super fast, ACID compliment database. It’ll be hard to show the performance of a cluster, as it’s running on a virtual machines, but we can definitely see redundancy. Now let go and shutdown one of the datanodes. Note that since we have 4 data nodes and 2 data groups (NoOfReplicas=2), we can kill up to 2 datanodes from each group and the cluster suppose to say alive. That looks pretty live to me… The cluster still working even though two data nodes are dead. Let’s restart the server and see what will happen. All I’m going to do is to re-run the agent application on the failing server. If it was a totally new fresh server, I also had to go through the initial process of un-packing the cluster package, agent and setup the hosts file, making sure the new server has the same network IP and hostname as the old one. The cluster is up and running with all nodes active, without having to do anything! Upgrade of the cluster can be done quite easy as well. Watch Andrew’s flash to see how. MySQL Cluster Manager makes installing, configuring, managing & monitoring much easier than ever before. It’s an easy tool that can be easily scripted and it’s only make sense to use it if you’re running cluster in production, where cluster has to keep it’s 99.999% uptime. While MCM is part of the commercial MySQL Cluster Carrier Grade Edition, users can download and use MCM to build their own cluster, without obligation, for 30 days.